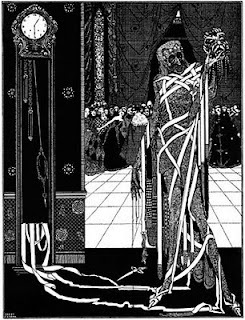 The Masque of the Red Death, a Gothic tale by American writer Edgar Allan Poe (1809-1849) tells the story of Prince Prospero. The prince was a wealthy but selfish ruler who saw his dominion ravaged by the Red Death. Prospero retreats to a castle like abbey with a thousand knights and ladies selected from his court. 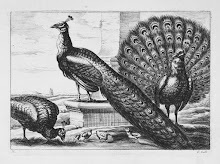 While his subjects die outside, he and his inner circle feast and are amused by musicians, dancers, and clowns. The culmination of the festivities is a masquerade ball. Amidst the revelers dressed in alluring and grotesque costumes arrives the Red Death. 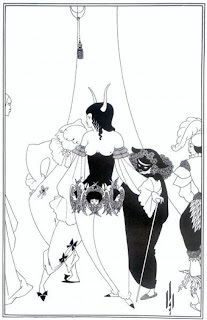 English artist Aubrey Beardsley (1872-1898) who died an early death from tuberculosis, illustrated the costumed court. Later Irish Harry Clarke (1889–1931) who would also die prematurely of tuberculosis, depicted the actual Red Death. Masques were popular courtly entertainment in sixteenth and seventeenth century Europe. 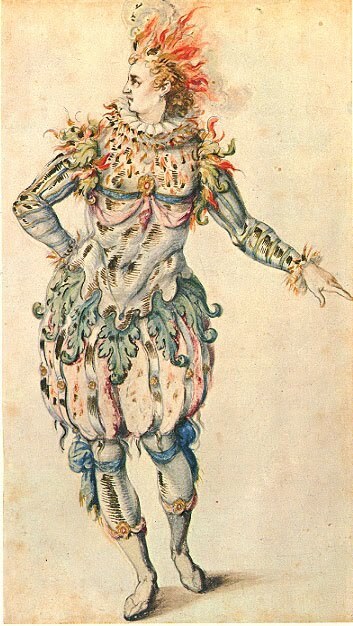 Elaborate costumes such as A Star were designed by British architect Inigo Jones (1573-1652) for the court of James I. Jones was influenced by his visits to the Medici Court which had extravagant fetes. 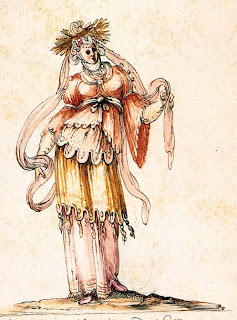 There the Florentine stage designer and theater architect Bernardo Buontalenti (1531-1608) designed allegorical costumes like A Muse.